Kane & Millie, 1-year old Great Pyrenees’ – Kane suffered a broken pelvis from being hit by a car, and Millie stood by his side until rescue came. Millie then delivered 6 babies, mothered them all, and was finally reunited with Kane in a forever home. Thank you to everyone who donated to their need! DJ, 8-year old Lab – DJ was chained up on a concrete slab for most of his life. His owner was threatening to shoot him if no one came to get him. Puppy Haven took him in and he was saved. DJ then suffered a brain infection, which caused him to have vestibular issues. He could not walk in a straight line, and would eventually fall over. Thank you to people like you who donated toward his treatment! DJ now lives in his forever home, unchained and able to sleep on a warm bed. To all of our puppies who suffered Parvo and survived: YOU ARE SO WORTH THE FIGHT! People fought to save you. People donated towards your care. People prayed for you, and cried for your siblings who did not make it. We forever love our lost ones. Thank you to all of our friends who have joined us in the fight against Parvo! 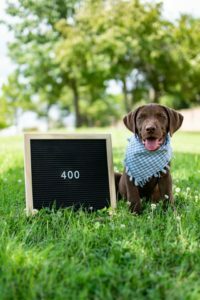 “Today, we’re celebrating dog number 400 we’ve been able to rescue in the 14 months we’ve been around. I want to say thank you to every volunteer, foster, adopter, and my amazing team that makes this all possible. So many families have been completed because of your dedication. So many innocent lives have been spared because of your love. So many happy endings have happened because of your sacrifice. Thank you for never giving up on these babies and for fighting for them as hard as I do. I love my Puppy Haven puppies and I love my Puppy Haven team. Here’s to the next 400. Our rescues are lucky because we fight for them, and they are the ones we were able to save. Some homeless or abused pets don’t get to be so lucky. They so deserve the fight to be saved. So we will continue fighting for them, and with your help, we will save 400 more and then some in our next year. Join our fight and our mission! We are so thankful to those of you have already. THANK YOU FROM PUPPY HAVEN RESCUE AND HERSHEY! ← Interested in doing behind-the-scenes work for a rescue?